The Bishop Eustace Preparatory school community invites you to join us in our journey as we prepare together for the birth of the Lord. Please take a moment to enjoy the reflection below from Fr. Michal Wojciak, S.A.C. on the first week of Advent. From the perspective of a believer, we can say that we live between two events: the resurrected Christ and His second coming. We know that, right? During every Holy Mass, we are begging God: Thy Kingdom come or ...until You come again. More or less consciously, we are saying: Lord God, let this world end. Fulfill the promise and come. It may sound a bit strange, but in a way, every week, participating in the Sunday Eucharist, we appeal to the Lord for the end of the world. And the Lord will come. When? At a time which he considers appropriate. Advent, which is just beginning, is another opportunity to look at our lives a bit more closely than usual. The dramatic appeals of the Old Testament prophets, which will be read in the next four weeks, encourage, among other things, looking into ourselves more deeply. One thing is sure and unchanging: Christ will come back in glory, not as an unprotected infant born in a sheep's cave near Bethlehem, but in a very clear and obvious way to everyone. We will not need faith anymore because we will see with our own eyes. This raises a key question for each of us - will this day fall on me like a trap? Such a question appears in the Gospel of the first Sunday of Advent. As an individual, this day will fall on me when my death comes. It is a private end of the world for me. In a sense, you can think of your life as your Advent which lasts from your Baptism to your final Holy Communion. In the Gospel, Jesus is speaking of his second coming and is describing what will happen at that time. He warns that we must be true to our faith and not let our hearts become drowsy from gluttony, drunkenness and the anxieties of daily life lest, as mentioned above, we are trapped on that final day and not prepared for his final coming. Jesus is saying these three things are major obstacles to you being prepared for his second coming and for your personal birth to eternal life. 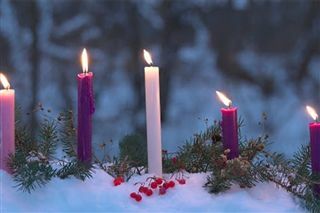 Addressing these three weaknesses can be a form of survival and spiritual growth during this year's Advent. Addressing them now will bear fruit when your Adventis over and the Lord is able to say: Well done, good and faithful servant, come to the joy of your Lord!